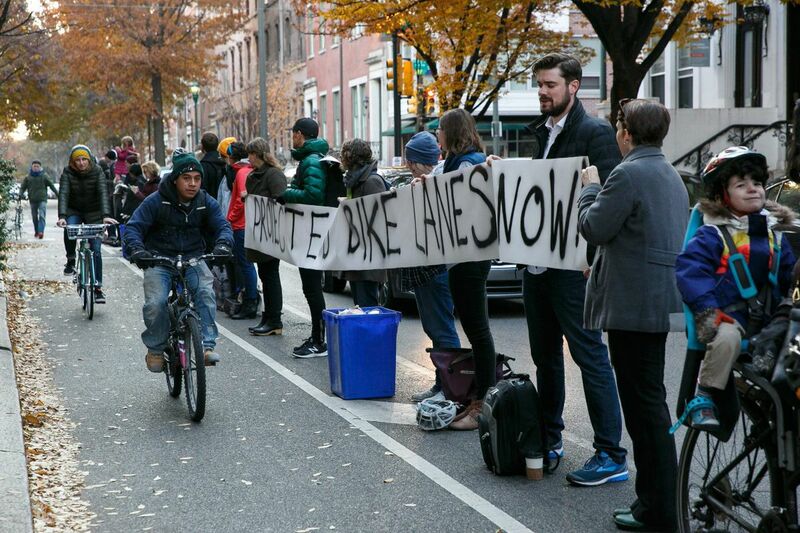 Protesters advocate for safer bike lanes by lining up at 11th and Spruce Streets on Wednesday. A cyclist’s death has spurred debate about how Philadelphia could be safer for cyclists. The death of a 24-year-old woman involved in a biking accident has spurred activists to call on Philadelphia officials for safer bike lanes. Emily Fredricks, who was riding in a designated bike lane on Spruce Street near 11th Street on her way to work at Le Chéri in Rittenhouse, died Tuesday after she was hit by a privately owned trash truck. A day after her death, protesters formed a human chain to create a protected bike lane along Spruce Street. About 200 miles of Philadelphia's streets have bike lanes, but just 2.5 miles of those are protected lanes — usually separated by something like a flexible post to put a physical barrier between driver and cyclist. The fatal crash has reignited a the culture war between cars and bikes in Philadelphia. We asked you to share thoughts on whether the City of Brotherly Love is safe for cyclists and what additional steps could be taken. Here's what you said. Instagram user @beaucycled noted that "people are always driving and turning in the bike lanes. Ticketing cars in bike lanes is a start, medians would be safest for drivers and cyclists." Another user, @Ryangreenberg agreed: "Separating them with a median would be wise and preventing/ticketing cars parked in these lanes (even on Sunday's and holidays) would be a major plus too." Instagrammer @_kakakakaty thinks there's a misunderstanding between cyclists and motorists: "I think there needs to be better education about bike laws," @_kakakakaty wrote. "Drivers need to understand that cyclists are allowed on the roads, but also cyclists need to be more careful at intersections. Not saying this guy was at fault though. Just something I've observed when driving or biking." Many commenters on Philly.com's Facebook page said they believe cyclists need to be more cautious while riding. Theresa-Terri Dowling McCabe wrote on Facebook that cyclists "need to follow the rules just like everyone else and they should receive a ticket for breaking the law." But Facebook user Chris Martin suggested that Philly "try what New York City has done" by "switching parking spots and bike lanes" to "keep more distance between the trucks and cyclists." "Bike lanes are too close which makes it difficult for a truck to see someone in or around their blind spot," Martin noted. "It also gives both driver and biker more reaction time." User Robert Smash-Antonio had another traffic-related suggestion. "How about a few roads that are closed to all normal vehicular traffic that are used only for trolleys/buses and bikes?" Smash-Antonio wrote. "Local deliveries and cars only allowed to turn onto the streets to park on that same block, no block-block travel permitted. Then you get rapid public transit with minimal infrastructure, and vastly more safe bike lanes." Are cities meant for cars or bikes? A few debated if Philadelphia's infastructure is even meant for cars. "It's totally not fair for us drivers! If they want fair then the should have to pay registration fees and insurance and be licensed," wrote user Dani Stone. "They have no responsibilities, so they don't care they interrupt the flow of traffic. Cities are just not meant for bikes!" Some noted that Philly's streets weren't built for cars when they were planned centuries ago. "Cars are not really meant for urban environments. America's love affair with the automobile (combined with a powerful auto lobby) is partly what led to the virtual collapse of our nation's cities during the post war era," wrote Facebooker John Nichols. "You don't change an entire city because an infinitely small number of people want to ride a bike," Holliday wrote. Have a thought you'd like to share? Send an email to audience@philly.com.